This letter is no longer for sale as of 20 August 2010. Unique and original manuscript letter signed by Arthur M. Schlesinger, which is the first reference by a notable person to my Angleton/Eliot same man theory. The Angleton/Eliot same man theory points to the distinct possibility of a dynamic Anglo-American (or Anglo-Rus?) spy duo of sorts at the heart of the Zionist state's nuclear weapons program. A must have for the true aficionado of the Arab-Zionist dispute, especially since poor diplomacy under US President George W. Bush turned it into an Iranian/Arab-Zionist dispute. Be the first and only world citizen on this planet earth to obtain this revelatory note not just for its historical value, but for the promise it holds for a more enlightened future with a region from the Nile to the Euphrates rivers entirely free of weapons of mass destruction. Not a museum piece! This is live ammunition! This letter is no longer for sale as of 20 August 2010. 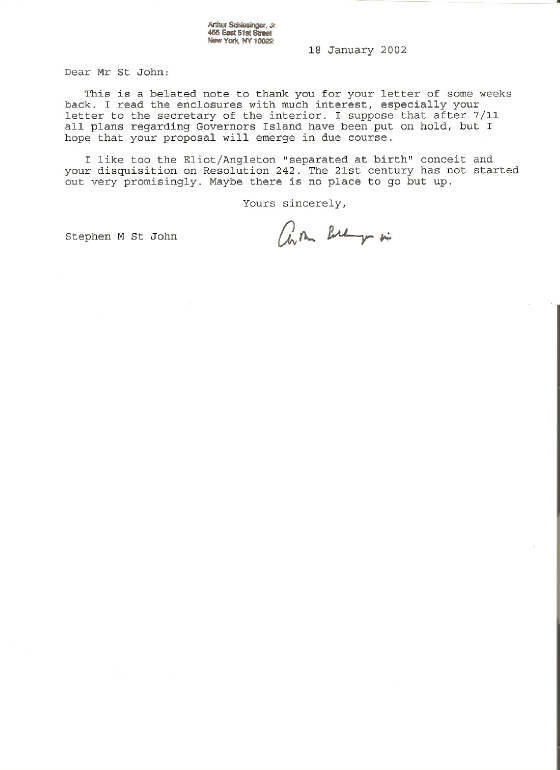 A note from the late, great historian and presidential adviser Arthur M. Schlesinger, Jr., in which first-ever reference to my James Jesus Angleton/Thomas Stearns Eliot Same Man Theory occurs. The 18 January 2002 note is a precursor by 15 months of the 7 April 2003 extraordinary published statement of former CIA Director Richard McGarrah Helms that former CIA Counterintelligence Chief James Jesus Angleton had a "not entirely coincidental resemblance to T. S. Eliot" (see A Look over My Shoulder, p. 153). If Angleton actually posed as Eliot from time to time on counterespionage missions in London, England, as I believe he did, then the histories of the Cold War, the JFK assassination and the Zionist state's nuclear weapons program will have to be rewritten. Moreover, such an earth shaking state secret may very well be the key factor in the demises of Princess Diana (1997) and Dr. David Kelly (2003). SO YOU CAN OWN NOT ONLY A PIECE OF THE HISTORICAL RECORD, BUT A SPARK THAT WILL KINDLE A LIGHT INTO THE FUTURE, A LIGHT OF CIVIL DISCOURSE ON SOVEREIGN POWER. And you will know the full meaning of the message inside the fortune cookie I ate in Cambridge in 1977: "You will have a hilarious time with men wearing make-up!" Schlesinger's note to me is typewritten on a 8 1/2" X 4 1/2" slip of paper and has a very slight smudge on "Jr." at the end of the handwritten signature. Price: $3,000,000.00 This letter is no longer for sale as of 20 August 2010. Contact information appears below, and for more information, please visit my website at http://www.show-the-house.com and click "Letter to Arthur M. Schlesinger, Jr." (with links) and "E-mail to BBC's Rowena Thursby" (also with links).